This entry was posted in Faculty and tagged biography, James R. Hansen on May 7, 2014 by Wire Eagle. AUBURN UNIVERSITY – The life of the man whose name is synonymous with premier golf course architecture, and is particularly well-known in the state of Alabama for the 26-course public golf trail that bears his name, is the subject of a new biography written by Auburn University professor and historian James R. Hansen. 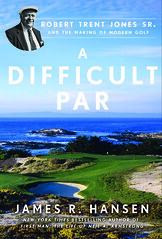 “A Difficult Par: Robert Trent Jones Sr. and the Making of Modern Golf,” to be released May 8 by Gotham Books, a member of Penguin Group (USA) LLC, tells the life story of the man behind many of the defining forms, shapes and challenges of the modern golf course. Hansen will sign copies of the book on Saturday, May 10, from 2-4 p.m. at Books-A-Million in the TigerTown shopping center in Opelika. Hansen also will give a public talk and book-signing on Thursday, May 22, at 3 p.m. in the Special Collections room of the Ralph Brown Draughon Library on the Auburn University campus. Hansen, a professor of history in the College of Liberal Arts at Auburn since 1986, recently has taught a popular honors seminar on the history of golf course architecture. He said his interest in golf goes back to his youth and led to his being co-captain of his college golf team. In addition to writing, playing, researching and teaching the history of golf, Hansen has served for nearly two decades as a course rating panelist for the publication Golfweek. Hansen said he dug deep for information in the business and personal papers of Robert Trent Jones Sr., which with his help came to be stored in the Cornell University archives, and prodded hard in interviews and correspondence with Jones’s family and associates. Hansen has published books and articles on a variety of topics ranging from the environmental history of golf, the early days of aviation, the first nuclear fusion reactors and the moon landings. One of Hansen’s previous books, “First Man,” the first and only authorized biography of Neil Armstrong, the first man on the moon, spent three weeks on the New York Times best-seller list and has garnered several major book awards.